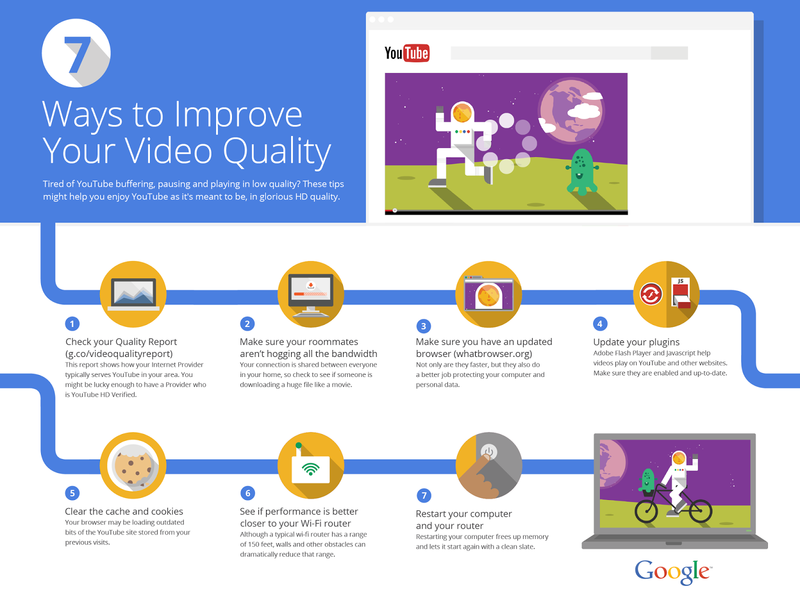 Official Google Australia Blog: What video quality do you watch your YouTube in? What video quality do you watch your YouTube in? YouTube video you’re watching keeps buffering or going fuzzy, which is why we’re always working to make videos play in the best quality possible. If you’re regularly seeing a buffering wheel when you play YouTube videos, it’s important to know why. Starting today, Aussies can use the Google Video Quality Report to better understand the video quality available from their Internet service providers. HD Verified: Users on YouTube HD Verified networks should expect smooth playback most of the time when watching high-definition YouTube videos (720p and above). Standard Definition: Users on networks rated as Standard Definition should expect smooth playback on standard-definition YouTube videos (360p) and may experience occasional interruptions on high-definition YouTube videos (720p and above). Lower Definition: Users on networks rated as Lower Definition may experience fuzzy picture quality and frequent interruptions while playing YouTube videos at 360p and above. If you’re keen to learn more about how we came up with these classifications, read more here, and learn how videos get from us to you with this video. We hope to keep finding better ways to bring you the best video experience possible, and part of that is helping you understand the way YouTube videos play when you watch it today. If the YouTube videos you watch are constantly lagging, we want to help you better understand why. Learning how to make the perfect French Toast can be hard if the Nicko’s Kitchen YouTube video you’re watching keeps buffering or going fuzzy, which is why we’re always working to make videos play in the best quality possible.